A compact combo with plenty of power, tone, and versatility. 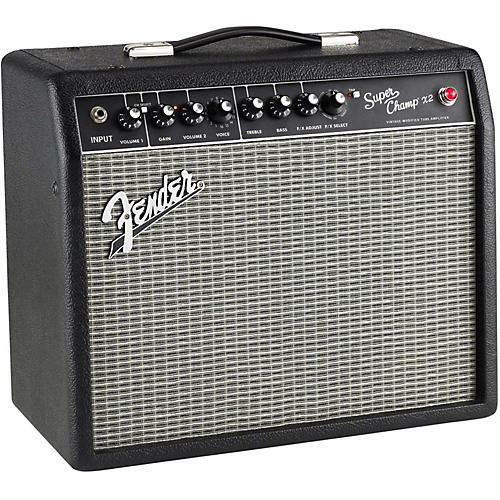 The Fender Super-Champ X2 15W 1x10 Tube Guitar Combo Amp combines 15 watts of rich, dual-channel tube amp sound with modern extras such as versatile amp voicing and a wide selection of digital effects. It's simple, toneful and flexible, and with its easy computer connectivity you can also custom tailor your amp's voicing and effects to your personal taste. Your rehearsal and recording sessions will really come alive with the unlimited tones that can be created with the Super Champ X2. Made in Ensenada, Mexico, the Super Champ X2 features a single 10" Fender Special Design speaker, voicing knob for selection of 16 different amp types (tweed, Blackface, British, metal and more), 15 effects with level control, dual-channel switching (footswitch optional), tap tempo control for precise delay time adjustment, 1/4" line output, external speaker capability and USB output for speaker emulated digital recording. Fender FUSE software (available as a free download) allows even more tonal versatility, with customization of amp voicing and effects defaults, effects parameters deep editing, and online access to free Fender community content. Unique Features: 15 Watt tube power amp with two 6V6 tubes, 12AX7 preamp tube, 10 inch Fender Special Design speaker (combo amp), Voicing knob with 16 different amp types (Tweed, Blackface, British, Metal, etc. ), Two channels with channel-switching format (optional footswitch available, P/N 0073858000), 15 effects with effects adjust control, TAP tempo control for delay time/modulation rate adjustments, External speaker capability, 1/4" Line output, USB output for speaker-emulated digital recording, Software (free download) allows additional flexibility.